Robert Vetica, celebrity stylist for the likes of Jessica Simpson, Mila Kunis, Salma Hayek and Marion Cotillard, and who has been featured in Elle, New York Times Magazine and a host of other high fashion spreads, is the new brand ambassador for the beloved Moroccanoil hair care line. He sat down with NaturallyCurly to talk about his experience with hair, how all stylists should know how to treat textured hair, why the Moroccanoil line contains silicones, and why you shouldn't be afraid of them. Blunt, honest and open, Vetica is a man who has followed his passion from a young age, even when that passion wasn't one accepted by mainstream society. For us here at NaturallyCurly, his eye for beauty and drive to understand his passion from all angles and through all textures puts him on #teamnatural. But don't take our word it. Take his. Can you tell us a little bit about you and how you got to where you are now? My passion for hairdressing started at my mother’s kitchen table when I was about 13. I started playing with her hair in the ‘60s. At that time women would go every Saturday and have their hair done, and then every Thursday to have a redo. I would sit around with them and do their hair and they were like, “Oh my god, you can actually do that!” I would do that every Thursday, but I wasn’t allowed to tell anybody because guys didn’t do hair. Fast forward. I went to beauty school after a short stint at a musical conservatory, because I’m a classical pianist, and I ended up convincing them that this was my passion. That was back in 1975. I was just very passionate about it from the beginning. I think it was a combination of use and passion combined with boredom and opportunity that kept moving me forward around the globe. And I ended up in many places. I went to school at Julliard, went to Europe, then ended up in Milan and stayed there for 10 years. I ended up at all the fashion shows and in the magazines like Vogue and Harper’s Bazaar, everything that you can think of in the fashion world. I mean, if it were up to me and I were a woman, I would want the curl and the wave. There is just so much more you can do with it. In 1994, I moved back to the states, to Los Angeles. I had already had a stint in New York and it just wasn’t for me. So I decided to go to L.A. and I came from a strong fashion background. I didn’t intend to get into any of this. I was 37 and I wanted to come to the states and start a life, because I had been travelling for 20 years. In anybody’s life, you go through cycles, and it was the end of a cycle for me. I was just ready for change. So when I came here, it was just an off shot that celebrity and fashion collided. I started to do celebrities mostly because in the 90s, photographers were still responsible for hiring the hairdressers for their models. I met a lot of great photographers, and then met a lot of celebrities, and that has turned to what it is today. It was a lot of opportunity and timing and passion. Here I am today having written a very successful hairdressing book for the consumer, and most recently, I have become the global ambassador for Moroccanoil, which lets me go around the world and share my experience, my strength, my hope and of course my continual relationship with hair. That is the most important thing. People are very interested in what I do because they think that celebrities are different. They think that they aren’t real human beings when in fact, it is quite the opposite. What about your experience with textured hair? Well, you have every quality of hair that there is. Everybody has their own. I’m a hairdresser, so I have experience with all textures of hair. I’m really glad that you said that. One of the things for women with textured hair is that it is often difficult to find a hairdresser who knows how to deal with waves, curls or coils without straightening them or providing relaxers. It's refreshing to hear you say, “I’m a stylist. I know how to deal with all types of hair.” That's the way it should be. Of course. You would think. I think one of the biggest problems that most hairdressers have, as far as texture, coloring, everything, is this fear of the unknown. There should be no fear attached to it because hair is hair. If you have an understanding of hair then you know, we all know, that if your hair is curly and you cut it wet and pull it straight, it is going to be shorter once it dries. It’s funny because the age old saying that women with curly hair want straight hair and that women with straight hair want curly hair is true, but the better of the two is the woman with wavy, thick, curly, coarse hair. I mean, if it were up to me and I were a woman, I would want the curl and the wave. There is just so much more you can do with it. Tell me a little bit about Moroccanoil and your involvement with them. My relationship with any company that I work with is two fold. One is that the brand representative has to be someone who can sell the brand and two, I have to actually use the product. I have to believe in the product. You have to remember something. Once hair grows out of the head, it is dead. There is nothing you can do to it to actually change the actual structure of hair. Besides, of course, a permanent in which you are reforming it. About three years ago, their PR company sent me the oil and because I work in such a high profile area, it is difficult for me to try new product. I always have to try the new products blind. It took me a try to start working with it. I noticed that the oil itself had such an immediate affect on all hair types, but especially the wavy and curly and coarse hair types. So, I started to use this. It has this ability to attain moisture. For me, it is like a moisture magnet. 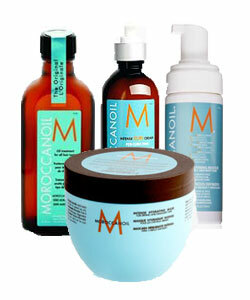 Moroccanoil’s hair care line, all their products, are very moisture defined. It is about retaining and adding moisture to the hair. You won’t find a lot of alcohol in their products. You are going to find a lot of vitamins, a lot of anti-oxidants, a lot of protein in their mask to restore the moisture balance to the hair. Let’s talk a little bit more about their ingredients. Our community is very educated about hair care ingredients: no parabens, no sulfates, and to a large extent, no silicones. You have to remember something. Once hair grows out of the head, it is dead. There is nothing you can do to it to change the actual structure of hair. Besides, of course, a perm in which you are reforming it. As far as products are concerned, as a consumer, you can't go and buy something that will actually restore the health of your hair. You can, in reality, have a product like Moroccanoil, which can restore the physical appearance, feeling and touch of it. It isn’t going to actually restore it to its original form, as it grew out of your head, but it is going to restore the visible aspect of it. As far as silicones are concerned, it is not the quantity of the ingredients. It is the quality of the ingredients. You can find pharmaceutical grade silicones where the quality is not as heavy and is more refined. It doesn’t leave the hair oily, and that is the difference between the Moroccan Oil Treatment, which has silicones in it, and others. The pharmaceutical grade silicones are so refined that they won’t weigh the hair down. And, because of that definition alone, it absorbs into the first layer of the hair and doesn’t just sit on top of it. Let’s talk about how to use the product line. Do you use every single product, would you recommended women use every step? For someone with fine, wavy hair versus someone with coarse, coily hair, are there different ways they should use it? Anytime you use a new product, you should use small amounts. There is just no question and we are no exception. You’ll notice, depending on how much you use, how the product establishes itself on your hair. We have two versions of the treatment. One is for thicker, darker, wavier, coarser hair, and the lighter version is for finer textured hair and lighter colored hair. As for the shampoos and conditioners, we have a volumizing shampoo and conditioner for finer hair, hair that has fine density. You have three different types of density: fine density, medium and thick. And you have three different textures: fine, wavy and curly. So, you can mix all three of those up together, which is why we have two different shampoos and conditioners as well as restorative masks. There is the light version, the normal version and the heavier version, which is actually a restorative, hydrating mask. It is for weekly use. The other restorative masks are for monthly use if your hair is really damaged. Actually with the restorative mask, you have to condition your hair afterwards because it has a lot of protein in it. Activated protein can restore, like I said, nothing can replace the original health of your hair, but it can restore it back to a visible healthiness that will last a long time. When you add protein to the hair, you are actually building it up on the follicle so the strand gets really strong. Adding protein to your hair in a mask like that is sort of, I repeat sort of, I’m not going to say that it is a chemical process, but all shampoos and conditioners are chemical processes. People don’t understand that. So, a lot of people over-wash or over-clean their hair. It just gets drier and drier and drier. We don’t recommend that. We recommend that you wash your hair once every second or third day, regardless. You can rinse your hair in between. But, back to the restorative mask, it actually has the most potent ingredients in it. With all that protein, you want to leave it on for five minutes max and then you want to condition with our conditioner right afterwards. So, while our community is extremely educated about silicones, parabens and sulfates, do you see that this education about hair care and ingredients is taking root in the celebrity world as well? Moroccan Oil, a brand many celebrities prefer, is obviously taking a step in the right direction being sulfate and paraben free. Is that something celebrities are picking up on? I have a couple clients that go completely, 100 percent organic. I don’t know if that is really such a great thing on your hair myself because I don’t know, especially if your hair is damaged, how you expect to refurbish your hair to bring it back to some kind of life. What would you say the perception of curly hair is in Hollywood or as far as using curly hair for magazine covers, for which you often style hair? Shoot, I don’t know. I don’t know what they think. I’m just saying what I see, but you really don’t see much of it, do you? First of all, you have to think of a cover of a magazine and if someone’s hair were really big, it would cover the whole magazine. I don’t think that Hollywood is a really good representation of curly hair because they are really cookie cutter, especially in the cover world. If you look at covers, it is pretty generic. You could actually take a person on the cover, and she could be on any cover if you took away the title. I don’t think that Hollywood is a really good representation of it because they are really cookie cutter, especially in the cover world. If you look at covers, it is pretty generic. You could actually take a person on the cover, and she could be on any cover if you took away the title, like the InStyle or the Cosmopolitan. They used to have their own women. There was a time when Cosmopolitan was all about sexiness and InStyle was more about going to the store and Glamour was more glamorous. Now, they are pretty much generic. I think the curly hair thing, even though it is amazing, it kind of scares people. I don’t know. I don’t know why they wouldn’t use it. You know I’m doing a cover of InStyle next month and maybe we can do this with Salma [Hayek]. We did it curly, it was shorter and not so massive, on Latina, the last time she was on the cover of Latina. But, she’s the only one and I think that there is the whole side of it where people don’t want people to be SO different. So they want them to look more approachable. Do I mean that curly hair is not approachable? No, I don’t mean that at all. I think that more should own it [their curly hair] like Salma owns it. Any tips for naturally curly women? When you take the time to do your hair, do it: add the right product, don’t add too much heat. Everything that you do [at NC.com] is about education and yes, you should be concerned about parabens and sulfates because it is bad for the environment and bad for your hair. Obviously that is a no brainer. But silicones aren’t going to hurt anybody. If it is going to help the health of your hair then by all means, use it! Be smart about how you use hair products. We’ve tried to make the line as foolproof as possible. You know that when you use Moroccan Oil, it is all about moisture. Everybody is trying to follow the moisture guidelines now. It is interesting when you think about it because why weren’t we all thinking of that before? When I go to work, the first thing I do is put my hands in my client’s hair to see how it feels. Is it dry, is it oily, what do the ends feel like? It is second nature to me now and I can just tell by touch how much product I can use. And still to this day I start with really small amounts. You can always add on to it. It is important for people to understand that when you try new products you have to start small. With Moroccan Oil products, though, you really can’t go wrong. Not if you have curly hair.